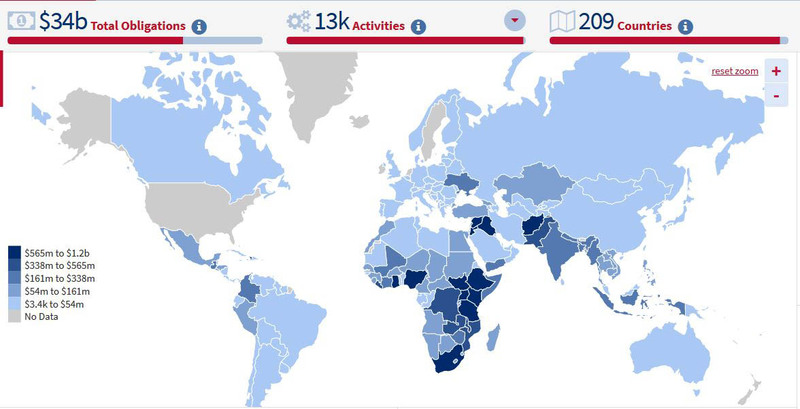 Which Countries Receive the Most Foreign Aid from the US? Submitted by Taps Coogan on the 20th of April to The Sounding Line. 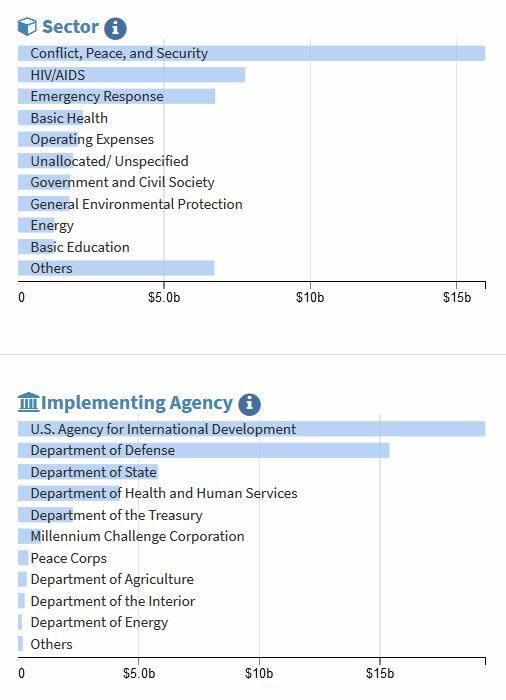 The US government gave away $49 billion of foreign aid 2016, the most recent date for which complete data is available. 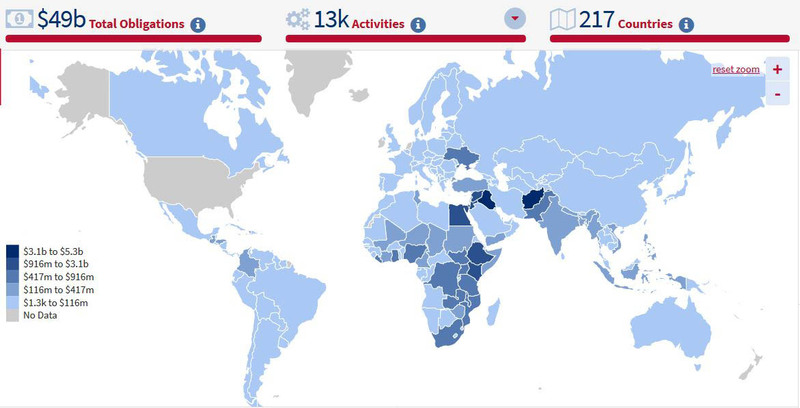 The following map, from the US AID website, shows which countries received that money and how much they got. Roughly one-third of US aid is military aid ($15 billion). The largest recipients are Iraq ($4.7 billion), Afghanistan ($3.8 billion), Israel ($3.1 billion), and Egypt ($1.1 billion). The following map shows which countries receive military aid. Not too surprisingly, the largest recipients are in the Middle East. The remaining two-thirds of US aid ($34 billion) is categorized as economic aid. Economic aid is more widely distributed and virtually every country receives some funds. That includes US archnemeses Russia, Iran, and North Korea. The largest recipients are Afghanistan ($1.17 billion), Ethiopia ($1.1 billion), and Kenya ($1 billion). 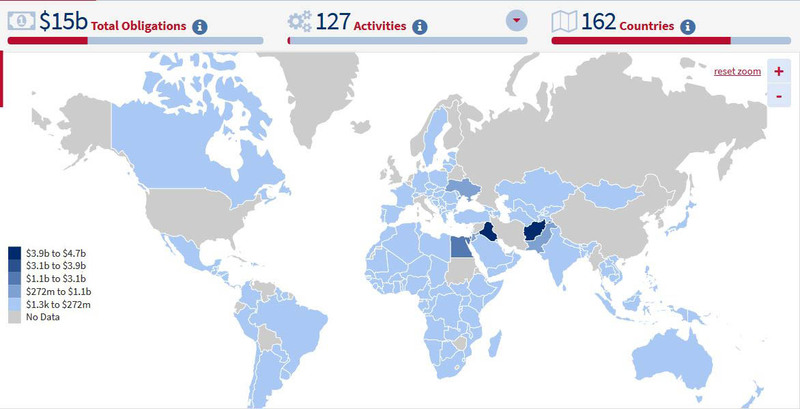 The following map shows which countries receive economic aid. The following charts break down which sectors receive the most funding. Military spending, aka ‘Conflicts, Peace and Security,’ is the top sector, followed by HIV/AIDS, emergency response, and basic health. The 2018 federal budget allocates $54 billion of US foreign aid, a significant increase over 2016 levels and a 7% decrease from 2017. Despite the fact that the federal government deficit is expected to swell to over $1 trillion a year, Congress has resisted calls to reduce foreign aid. Some argue that $54 billion in foreign aid is insignificant in the context of multi-trillion dollar budgets and thus not worth rationalizing. Yet when one considers that the US spends roughly 75% as much on foreign aid as it spends on the entire US Food Stamps program for America’s poor, it’s hard to argue that at least some of the aid money isn’t worth examining. While maintaining aid to poor or war torn countries in clear need has obvious merits, providing hundreds of millions of dollars of aid to places like China, Japan, and the EU is far more puzzling. Not only can these countries afford to fund their own aid programs, they are literally lending the US the very money that is returning to them in the form of aid. Have you mistaken the Netherlands for Denmark in the first chart? Because the Netherlands along with Ireland and New Zeeland are grey. Oops, yes I did. Fixed the mistake. Thanks for catching it!